The global tungsten carbide market is emerging at a rapid pace. The market is at an extremely competitive stage, and will remain so in future as well. Tungsten carbide is also used in the manufacturing of various automobile parts and components. One of the primary examples is that of car’s engine. The global tungsten carbide market, by value, is estimated to witness growth at a CAGR of 4.4% over the period 2016 to 2022. This growth in the market is attributed to the increasing demand for various applications such as metal cutting tools, wear parts, mining & drilling tools etc. and various end use industries like automotive, aerospace & defense, oil & gas, mining & construction, electronics etc. Tungsten carbide is a highly dense material constituting of tungsten and carbon as their constituent materials. They exhibit significant properties like extreme hardness, toughness, wear & abrasion resistance, pressure resistance, and many more. The unique combination of these properties and their cost effectiveness have set them apart to be the ideal choice of many industry manufacturers. The report is a compilation of different segments of global tungsten carbide market including market breakdown by application, end use industry and geographical location. It also includes sections on competitive insights and market dynamics. Herein the revenue generated from tungsten carbide is tracked to calculate the market size. While highlighting the key driving and restraining forces for this market, the report also provides a comprehensive section of the application areas of the tungsten carbide market. It also details the key participants involved in the industry. • What is global market size by value and volume of tungsten carbide market? What is the average price of tungsten carbide currently? • What are the different application areas of tungsten carbide? What is their contribution in terms of revenue to the overall tungsten carbide revenue? • What are the different end use industry verticals of tungsten carbide? What is their contribution in terms of revenue to the overall tungsten carbide revenue? • What are the different factors driving and challenging the global tungsten carbide market in the forecast period? • What are the different opportunities to look for investment in the tungsten carbide market? • Who are the leading players in the global tungsten carbide market? What are the key strategies they have followed to expand their market in tungsten carbide business? • What kind of new strategies are being adopted by established and naive participants to make a mark in the industry? • What is currently the average price of tungsten carbide globally? What is the price of this material in different regions and in different application verticals? • Which region will lead the global tungsten carbide market by the end of forecast period? Also which country in that specific region will have the largest and smallest market share by value and volume in the forecast period? • Which application will lead the global tungsten carbide market by the end of forecast period? • Which end use industry will find the largest usage of tungsten carbide in the forecast period? • What is the future trend that will trail in this industry and what can be the right domains to focus on to make a smart move in investment? The report has put special emphasis on the market share and size of automotive industry and wear parts industry, owing to their large scale share in the current and upcoming market of tungsten carbide. The industry analysis have also been done to examine the impact of various factors and understand the overall attractiveness of the industry. The most often used strategy for developing a better hold on to the market has been through product launches and developments, business expansions followed by mergers & acquisitions and partnerships, agreements & collaborations. The company profile section includes highlights of significant information about the key companies involved, along with their financials, financial summaries and key strategies & developmental activities of recent years. Some of the key players involved in this market are Sandvik, IMC Group, Kennametal, Mitsubishi Materials, Sumitomo Corporation, Hitachi Metals, Ceratizit S.A, China Minmetals, Xiamen Tungsten, and American Elements. Metal cutting application dominated the tungsten carbide market in 2015 accounting for a market share of 41.9% by value. Similarly, automotive industry held the highest market share by end use industry accounting for a market share of 36.3% in 2015.Asia Pacific generated the maximum amount of revenue in the year 2015 in the global tungsten carbide market followed by Europe and North America. Also, APAC currently has the highest potential to grow in the forecast period. If the industry has the prospects of growing at a similar pace, it will cross $ 3,355.0 million in total market value by the end of forecast period. 8.20 Rock River Tool Inc. The wide range of useful properties of tungsten carbide have led to the development of a number of applications, many of which are paving their way towards practical and commercial applicability. There are lots of metal compounds that are heavily used for various applications across the planet, but there are none that possess the particular attributes of tungsten carbide. Hence, the market potential of tungsten carbide is extremely high in this regard. The global tungsten carbide market is emerging at a rapid pace. The market is at an extremely competitive stage, and will remain so in future as well. Tungsten carbide is also used in the manufacturing of various automobile parts and components. One of the primary examples is that of car’s engine. They are actively dominating the automotive market and have the potential for usage in a range of user-applications. Tungsten carbide is slowly establishing itself in many more end use industries like medical, jewelry etc. and is anticipated to have a good growth potential in these. Some of the major players in the global tungsten carbide market are: Sandvik, IMC Group, Kennametal Inc., China Minmetals, Xiamen Tungsten, H.C Starck, Durit Hartmetall, Ceratizit S.A, American Elements, Chongyi Zhanguan. The global tungsten carbide market was worth $ 2,492.9 million in 2015, and is estimated to grow at a CAGR of 4.4% over the period of 2016-2022, hitting $ 3,355.0 million by 2022. Wide applications of these materials across automotive, aerospace & defense, oil & gas, mining & construction, electronics, wood & plastic working, medical & healthcare, jewelry etc. are likely to drive the market growth over the forecast period. 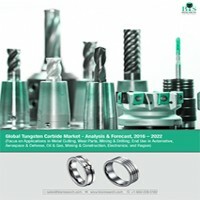 The tungsten carbide component are currently dominating in the metal cutting tools market amongst many other varied applications and a similar trend is expected to continue by the end of 2022. Asia Pacific region accounted for the largest market share of 49.4%, by value, in 2015 and this trend is expected to continue in the forecast period.